Demetria Frank is an Associate Professor at the University of Memphis School of Law. 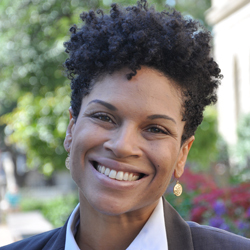 She is also the director of Project MI, a collaborative that aims to transform the criminal justice system by connecting communities to lawmakers. Demetria’s scholarly research focuses on prisoner rights and bias in the criminal justice system. A native Houstonian, Demetria attended the University of Texas School of Law and began her legal career as a toxic tort litigation attorney before moving into the public sector as a Community Prosecutor in the Dallas City Attorney’s Office. Her tenure as an Associate Judge for the City of Dallas has been one of the most influential experiences in her legal career. In her free time, Demetria enjoys cooking, travel, and spending time with her daughter, Tia.